You might notice some of the map markers will already be displayed when you first open the map (this is a small glitch we are working on fixing!). Due to the software used to create this map project it is highly recommended you open the link to this map in Mozilla Firefox (for PC) or Safari (for Mac) internet browsers rather than Internet Explorer www.shoess.ru (if you are using a PC). While it can be viewed in all internet browsers, there are more glitches when viewing the map in Internet Explorer (for PC). We hope to have all the glitches worked out as soon as possible!! You can zoom in or out of the map by clicking on the + or – sign on the zoom bar located on the far left of the Google Map below the Street View icon. The circle with the four direction arrows at the top left corner of the Google Map is used to allow you to move around on the map. Click the arrow for the direction you want to move in. You can also move around the map by left-clicking on your mouse while the curser is displayed over the map and holding the left clicker down you can move the mouse around and see that the map follows your direction. There are many sandstone structures on the map that will require you to zoom in and out or move North, South, East, or West to be able to view them. So make sure you use these tools to navigate around the map!! Street View is another way to view the map by streets in a 360 degree panoramic view. Please note that not all the roads where sandstone structures are located will be able to use the Street View application. To find out which streets you can view, click and drag the Street View Pegman icon over the map. You will notice that many of the roads will become highlighted in blue. You can place the Street View Pegman icon anywhere along the roads highlighted in blue. Once you've dropped your icon on a highlighted blue street, your Google Map has turned into a 360 degree panoramic view of the street from that point. You can rotate your view by using the direction wheel in the top left corner or by clicking and dragging your mouse around on the screen. You can also zoom in or out on a particular building in this map view by using the zoom bar or you can move up or down on the street by clicking the white arrows overlaid on the street on the map next to the street name. To Exit Street View: click on the X located in the top right corner of the street view screen. In the top right corner of the Google Map you will see it says Map and Satellite. Map is in bold while Satellite is not, that means the Google Map is in the plain terrain map mode. If you like how the map is viewed you do not need to change anything. If you want to switch to Satellite mode, click over where it says Satellite and notice the map will change to Google Imagery Map. If you keep zooming into the map you can see this satellite mode is much more detailed than Map mode. It is completely up to you which mode you prefer to view the map in. To switch to the previous mode you started with just click over where it says Map in the top right corner. Now that you know how to navigate through the Google Map you can explore all that is made of Potsdam Sandstone!! At the top of the map screen you should see a timeline bar from 1800 to 2020. You can move the bar from both left and right to view specific time periods of when sandstone structures were built. 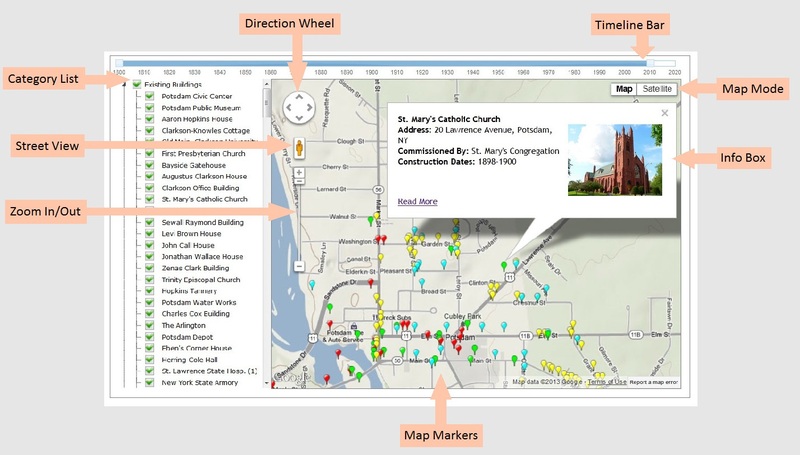 To the left of the map screen you will see a list of buildings, addresses, and other structures in different categories by scrolling down the list. To view a specific building on the map check the empty box to the left of its name. A green check mark will appear in the box and a colored map marker will appear on the map indicating where it is. If you do not see the colored map marker on the map you will need to zoom out and/or use the direction wheel until you see the marker appear on the map. Note: Potsdam Sandstone has been used in buildings as far away as Ottawa to Albany and Buffalo! To view all the buildings in a specific category you can check the box next to the category name. Once you do that you can see there will be green check marks next to all of the names under that category and the map will full up with all the colored map markers for each named sandstone structure. To uncheck a category or a specific structure under a category: click the green check mark to the left of its name and the green check mark and the map marker will both disappear from the map. To view the information of the sandstone structure you have selected, click on the colored map marker on the Google Map. As shown in the diagram at the top of this page an Info Box will pop up giving a few brief facts and picture of the sandstone structure. If you want to view more information about the structure click on the Read More link located at the bottom left corner of the Info Box. The Read More link will take you to a separate page with a brief history and sometimes more pictures of the sandstone structure. To return to the map go to the bottom of the Read More information page and click Back to Map or the Back button on your Internet browser. To Exit the Info Box click on the grey X in the top right corner of the box. Many specail thanks to Zach Shepherd, the creator of this open-source software, and to John Bridges for his enthusiasm and expertise in researching Potsdam Sandstone. Enjoy exploring our Sandstone "Interactive" Map!! !